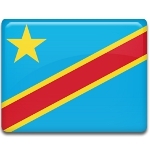 June 30 is Independence Day in the Democratic Republic of the Congo. This holiday celebrates the day, when the country gained independence from Belgium in 1960. Belgium annexed the Congo on October 18, 1908, setting its administration there for almost half a century. Belgian administration allowed a dual legal system: a system of European courts and a system of indigenous courts. The latter had restricted powers and was totally controlled by the colonial administration. Belgian administration allowed no political activity and recruited army under Belgian command, that put down any attempts of rebellion. In May 1960 Patrice Lumumba, a leader of the Mouvement National Congolais, won the parliamentary elections and became the first Prime Minister of the DR Congo. The country gained independence from Belgium on June 30, 1960, taking name the Republic of the Congo. In 1971 it was renamed to the Republic of Zaire. The name was changed again in 1997, when the country adopted its present-day name.